The blues on a cruise! What could possibly be better than such an event, other than the fact that they rhyme perfectly? The Legendary Rhythm and Blues Cruise #22 through the East Caribbean will take place from Oct 4th 2014 to the 11th of the same month. The Holland America Cruise ship will make its journey from Ft. Lauderdale, FL roundtrip to St. Maarten, St. Thomas/St. John and Turks & Caicos on the Holland America ms Nieuw Amsterdam. The Legendary Rhythm and Blues Cruise has truly been legendary for all these years. The LRBC experience, as they fancily like to call it, has definitely been a life changing one, for many. The setting, similar to a Blues Village, allows the cruiser to feel the whole trip, inside and out. Being twice awarded the Blues Promoter of the Year, Roger Naber is one the forerunners of this carnival of music. The musical journey commences and lures on, till as early as dawn, the next day. Being a part of this cruise is like earning for yourself a backstage pass for the entire event. That being, one of the most fascinating things of the LBRC! The jamming sessions include intimate interactions of the artists with their listeners. Autograph sessions, discussions, musical instruments on display and so much more, that adds to the fun that this festival is! The surprise element, of not being able to anticipate what is about to occur, keeps everyone going. One of the most intriguing things and perhaps the first of many reasons to be on this cruise is the incredible artist line-up. Taj Mahal backed by the Phantom Blues, Kenny Wayne Shepherd, Mel Waiters, , LRB Revue with Tommy Castro, Mike Finnigan, Chris Cain, Otis Clay, Tommy Castro & The Painkillers, John Hammond, Sugar Ray with the Blue Tones are just some of the artists performing on this week-long cruise! The absolute divine performances by Tommy Castro that usually traverse right through the night re-establish why he is the two time winner of B.B. King Entertainer of the Year award. Pianist Victor Wainwrights performances are delightful and insightful of his blues journey. Cruising through Ft. Lauderdale, Phillipsburg, Charlotte Amelie, Grand Turk, the cruise ends on the 26th, at Ft. Lauderdale where it had begun a week earlier. 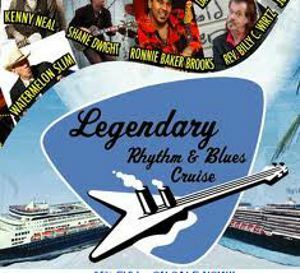 Quite obviously it leaves the cruisers wanting for more, thus resulting in the Legendary Rhythm & Blues Cruise #23 that is scheduled to begin eight months later, on October 4th 2014.